Hi guys! We’re taking a field trip today, out of my skybox and heading to Cotton Hollow Farm! BabyHoney Bailey’s latest project is cute as can be, and houses her new collection of farm accessories. I’ve pretty much escaped the chickens, turtles, bunnies craze without ever getting one cos I really don’t like a product that’s designed to give you enjoyment by costing you more money!! This farm thing though? I could dig this. Right now they don’t seem to be scripted to do anything, which is perfect. I just want to buy plants, rez them everywhere, and take cute photos. Psst.. don’t tell Bho I’m stealing one of her tomato plants! But if you’re into bunnies, there’s a huge bunny farm here. I’ve never seen so many in my slife. I’ve only really seen one bunny actually, so this was kind of cool and terrifying cos there was hover text everywhere. 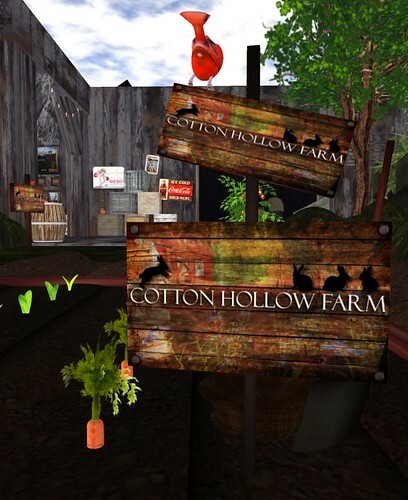 Visit Cotton Hollow Farm Flagship!